Thank you ATWAT for the copy! Let me start out by saying that I had no idea what to expect from this book. I ended up reading two books having to do with twins back to back, and honestly I wasn’t sure how well that was going to work for me. The other side of this is the fact that I was a little nervous about the whole 400 years in the future aspect. I adore science fiction, when its written well, and sometimes when its not I just want to cry myself to sleep at night. Now, after all that, I just like you to know that I enjoyed Erasing Time. Tremendously. Literally, I flew through this book in one sitting (with lots of stops because I was at work, but still). Erasing Time follows the story of two girls, who are twins, and get stuck 400 years in the future. Apparently, the world is falling apart and only someone from our time can save it (Or help destroy it. You know them political types). Sheridan and Taylor are both likable characters. They’re twins and sisters, but different like night and day. I really enjoyed the writing of them together, it was a nice contrast. Personally, I felt more drawn to Sheldon, the reserved twin. I felt like her character was one I could relate to more and I was rooting for her the whole book.Then, there is Echo. Oh Echo, the broken hero of the story. His character has a lot of potential behind it. There is depth, there is warrior, and there is the romantic. This maybe a little spoilery but there is no love triangle in this book, which made me insanely happy. I can’t say if that will change or not in the next one, it might, but as of right now, I’m glad its just one girl and one boy. Sometimes I just get so tired of the whole triangle thing, its nice to read something without it. Overall, this book was an interesting read! C.J. created a very realistic futuristic world, full of twists and turns. While I would have like a bit more character and relationship development (seriously, they just fall into the whole relationship thing) this is a good beginning to a series. C.J.’s use of words and descriptions will transport you 400 years in the future and take you on a journey like no other! 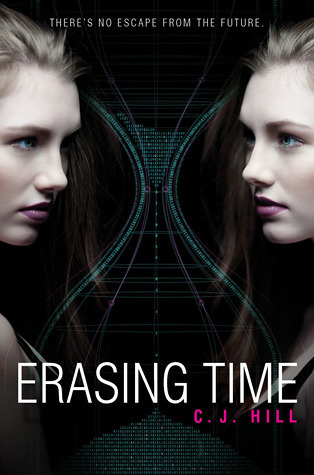 Erasing Time comes out August 28th! Let me know what you think! ← Simplicity Blog Tour Welcome!